The 2019 Honda Accord debuted at the last year’s Thailand International Motor Expo and looks all set to enter the Thai market. Compared to the earlier version, the tenth-gen Accord is bigger and measures 4.87-metre in length, 1.85-metre in width, and 1.45-metre in height. It has a wheelbase of 2.82-metre. However, the biggest talking point of the 2019 Honda Accord is its low-capacity petrol engine. The new model is powered by a 1.5-litre turbocharged petrol engine that produces a maximum power of 190 hp and a peak torque of 243 Nm. The new Accord is also available with a 2.0-litre four-cylinder petrol engine that is supported by electric motors that bump up the total output to 215 hp and 315 Nm. The 2019 Honda Accord looks totally different from the ninth-gen model that is on sale in the country. It sports the company’s latest design language, which gives the car a really modern and bold appearance. The front-end has sleek headlamps, LED fog lamps and enough chrome to emphasize on the car’s premium quotient. The rear gets C-shaped tail lamps and an integrated boot lid spoiler. On the inside, the 2019 Honda Accord comes with a floating-type touchscreen infotainment unit that supports both Apple CarPlay and Android Auto. The audio system is a 450-watt unit that has a 10 speaker setup with a subwoofer. The interior also gets a semi-digital instrument cluster, new upholstery, ambient lighting, 12-way adjustable electric driver seat with memory feature and 4-way electric-adjustable lumbar support. 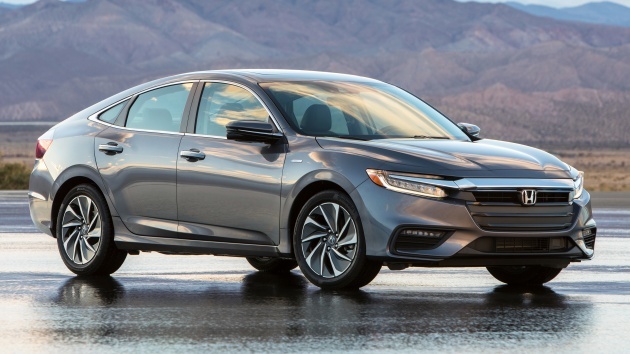 The safety net available on the 2019 Honda Accord includes ABS, stability control, front airbags, side airbags, overhead airbags, knee airbags, seatbelt pre-tensioners, and a comprehensive security system. Advanced driving assistance features on offer include autonomous emergency braking, lane departure warning and road departure mitigation. Other features available on the 2019 Honda Accord include a Head-up Display (HUD), 360-degree camera, parking sensors at front and rear, adaptive cruise control, wireless phone charging and Honda Smart Parking Assist System.